Known locally as "San Pedrito" (Little Saint Peter), The Puerto Rican Tody is a beautiful little bird endemic to the island of its name. These tiny birds fly around the forest in pairs, calling to each other and feeding on insects. Their bright coloring and small size lead many to believe that they are looking at a hummingbird, but the tody is actually closest related to a kingfisher. 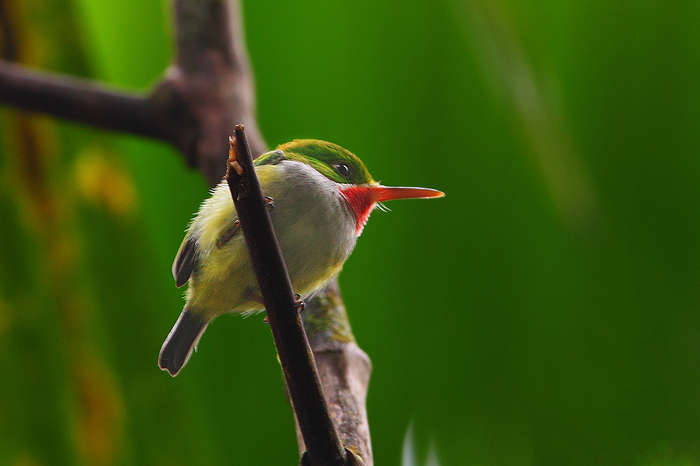 The Puerto Rican Tody is an especially small bird, with an average weight of around 5 grams. In thick forest, it is much easier to hear these birds than it is to see them. They don't sit still for long, which makes them especially difficult to photograph.